troopers between his 15th Hussars skirting the town and Slade’s 10th Hussars coming through it. Debelle was trying to break contact, but Paget moved more quickly. When Debelle saw he could not outrun Paget, he turned his two regiments to face the outnumbered 15th Hussars. Slade’s Hussar regiment was nowhere to be seen. 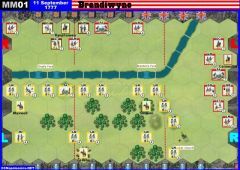 As bombastic as he was incompetent, Slade had halted his men to deliver a lengthy harangue, and his leading troops were only entering Sahagun by the time the battle ended. Undaunted, Paget charged at full gallop into the first line of French cavalry, a provisional chasseur regiment composed mainly of Hanoverians forced into French service. 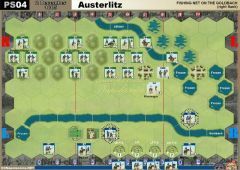 The regiment dissolved completely at first contact, with the retreating troopers throwing the reliable 8th French Dragoon Regiment behind them into disorder. provisional French chasseurs regiment was disbanded. 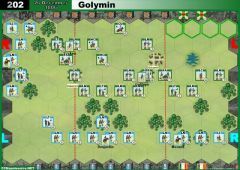 • *Both armies receive 1 Victory Point for each enemy block eliminated in battle. 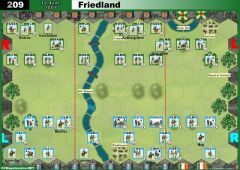 • *The French player receives 1 Victory Point for every cavalry or leader block that exits the battlefield from the river ford hex or the bridge, along the left side of the map. • The River Valderaduey is impassable except at the ford and bridge. The scenario picture shows 2 french Leaders "Debelle". The Leader attached to the Heavy Cavalry is "Dud’Huit". Despite GG's welcome, I think I'd still use the Tactician deck, though I dare say the relevance of the Tactician cards might be considerably diminished due to the all cavalry nature of the battle. However, that existed before any unit/card deck tampering on my part, it is the same Tactician Deck and all cavalry action RB designed. On the plus side, there is a goodly number of Tactican cards that have default use only, which could reflect the mobility of the cavalry commanders! RiverWanderer or Mark-McG: Have you tried this scenario again with RiverWanderer's card changes? I am wondering which is best: the card changes alone or Mark's 3 block cavalry for the French? 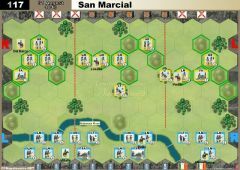 I'm experimenting with the following mix of variations; Make French Light Cav a militia type unit - retreat two blocks (haven't tried 3 yet), also -1 die on attack and -2 if battling back against a charge. 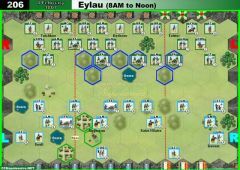 These make the light cav very weak, and the battle much closer to history in general. I will try something like the Russian Militia lancer spec next (3 hex retreat but ignore sabres totally). Card wise, I tried treating infantry and artillery Tactician cards as "Make strategic move with one unit (ie 4 hexes, no battle)" and otherwise ineffective Command cards as "move one unit" ... made for a better scenario I think, but I will try it a few times more. 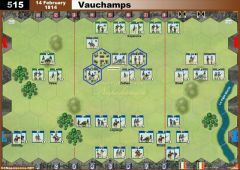 Got the chance to test this scenario using 3 block French cavalry yesterday, and the French still won 16-10. However, the English were quite unlucky with their rolls, with several air swings. 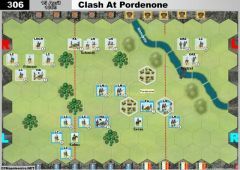 Moreover, the dynamic of the game certainly changes, the French can no longer rely upon harder hitting power and stronger units to use brute force to win. 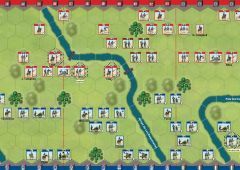 My previous experience was this is a 3-5 card play game, with the French cavalry smashing straight up the centre for the win. This time round the French lost 2 units, and managed to exit 3 blocks over a 50 minute game (on VASSAL) in a pretty tense match. The main problem we had was the card decks, with both the Command deck and Tactician deck turning up a lot of infantry cards that weren't much use. I'm considering a smaller deck for these scenarios, just to weed out the over powerful or narrow focus cards that sometimes can upset these scenarios. 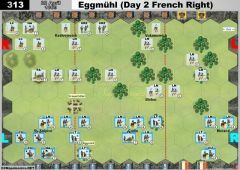 Overall, I found the French 3 block version was certainly no worse than the original, it changed the dynamic considerably and made for a tense match which followed the historical narrative somewhat more closely. So if the French cavalry were dropped down to 3 blocks per unit, would this make it a better scenario? 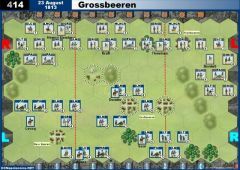 I'm always a bit concerned about all cavalry scenarios in C&C, because the Command Cards aren't really designed for it. Maybe the Command Deck should be weeded? A one-sided slaughter with the French winning easily. The French cavalry is over rated and annihilated the British cavalry easily. To rub it in one French unit rode across the bridge simply because their was no opposition. Quirky scenario - proper use of towns and woods is the key to this one. Not my favorite scenario by any means but I liked how the banner per block changes the dynamics. First 2 games and first 2 french victories.